After the first few sessions of our current campaign the players decided to write up a charter for their adventuring company to define how they would divvy up treasure, treat the wounded, etc. Some like the idea because it showed good faith and helped to mark down their fellowship. Others, because they see the written covenant as a tool to be manipulated. Such is the nature of characters. But the players all enjoy the fun both sides inspire within the game. and enter into covenant with our fellow members. The purpose of this company shall be to recover lost treasure and lore, to explore uncharted wilderness and underdark, and to provide common support, counsel, and protection to all fellows of the company. A Company member shall give his or her best effort in all tasks for the company, above all, defending the lives and property of fellow members. A member ill-suited to a task shall nevertheless aid those who are able. One found by majority to be willfully harming, or allowing the Company or its members to come to harm shall be expelled from the Company and forfeit all reward. A fellow who falls in the line of duty shall be accorded the following consideration: Immediate aid to injuries if possible, a proper burial & treasure distributed to the member’s kin if not. If Fate allows, the company shall put forth the coin for a ritual of resurrection. These bylaws are subject to change pending the approval of the majority of the Company’s Fellows. Profit shall be divided into three tiers. The first tier is that which is known to be of magical quality, including but not limited to magical arms and armor, potions, rings, wands, arcane formula, books of spells, etc. These items shall be divided by only the members as they see fit, but once selected may be given, sold, or loaned to others as decided by the owner. In the event that consensus cannot be reached contested items will be selected by drawing lots or other agreeable method among those contesting the item. If no agreeable method be known, casting fair dice shall be selected as the contest. The second tier of treasure is made of the items which have been designated by simple majority to belong to the company as a whole, until such time as they be sold and the profits be divided by share, or if magical, they be designated as treasure of the first tier. Items of the second tier may be placed into the stewardship of individual memberships, but such treasure must be used for the benefit of all members. The third tier of treasure is made of all saleable goods or moneys not of the first or second tiers, which shall be apportioned by shares. Any member may purchase at fair market value any goods which can be afforded from this tier with the payment entering into the common treasury to be split accordingly. Members of the Company may hire servitors, men-at-arms, or other such attendants and offer them as much as one-half share each of the third tier of treasure. The hiring member is responsible for the conduct of said servants which may be dismissed by the company as a whole by simple majority. All other agreements of remuneration such as additional monies, magic, or services are the responsibility of the individual member, and the Company is under no obligation to meet these fees or promises. The Shadowcaster Sailing Ship has been designated as treasure of the second tier, or property of the company as a whole. It is to be outfitted and operated by the company. The company will hire a Captain, who will exercise authority in sailing over the crew, but not in battle or in choosing ship’s destination. This Captain will be hired by Malia, and will act as her henchman, so will be owed one half of one share of treasure of the third tier found won by the company. The Crew of the Shadowcaster will be paid double the customary sailor’s wages and will split one half share of treasure of the third tier among them equally. Deserting crew will forfeit all claims to payment or share. Just wanted to share this fun little bit. 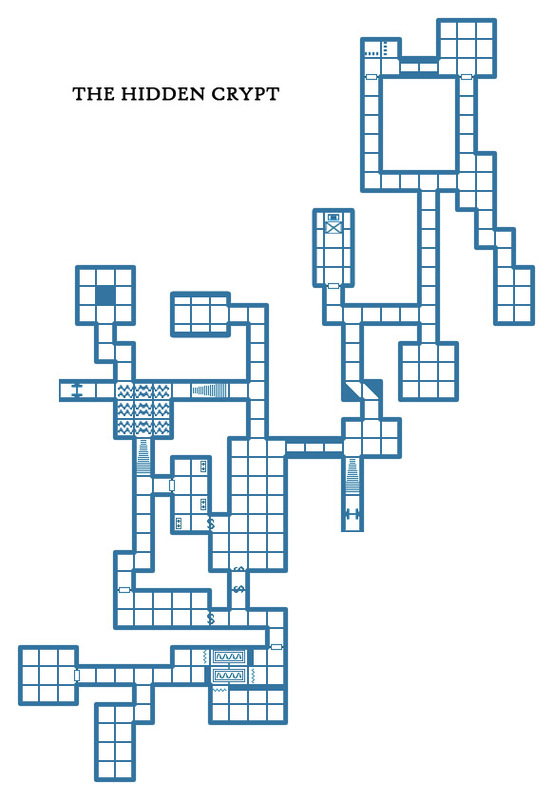 My group just completed exploring an ancient hidden crypt on their Great Island Adventures. Well, Ray's character, a Necromancer, decided to map the dungeon as they went along so they could find their way out and also know how to get back whenever they had to flee. And they did have to twice. Once while they were gone someone else explored a portion of the dungeon on them. The second time the monsters guarding the treasure they stole followed them back. All in all it was great fun. 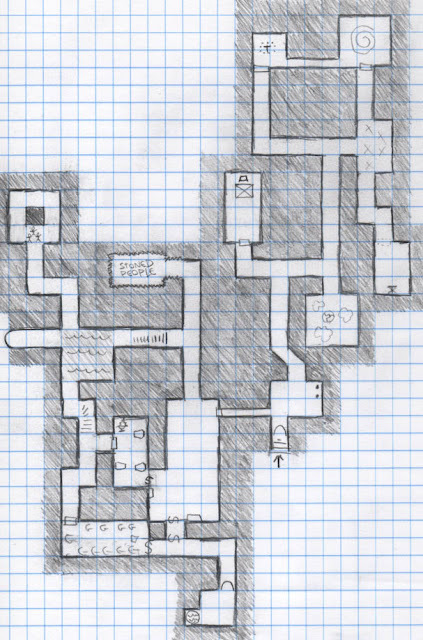 Below is the original copy of my map sans numbers along with the player's hand drawn version. The only portion they were unable to explore was beyond a cold pool of water protected by Ice Mephits. The mephits were hostile to the dwarf in the party and so it wasn't thought safe to chance it after the group had accepted their kindness.